Marcel Duchamp's Bicycle Wheel comprised of a bicycle fork and front wheel upside-down, mounted on a wooden stool. 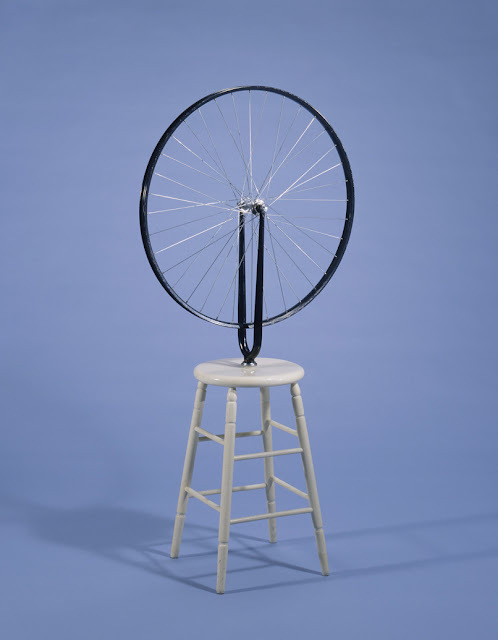 Duchamp made the original work in his Paris studio in 1913 and enjoyed watching it spin: "I enjoyed looking at it," he said. "Just as I enjoy looking at the flames dancing in the fireplace." He decided later on in New York that it was a readymade. Bicycle Wheel fits into the category of an 'assisted readymade' and like many of his readymades it combines its two comprising items in such a way so as nullify the intended function of each. The work is often considered to be the first kinetic sculpture.